In Virginia, a subpoena duces tecum is a subpoena that requires documents, and possibly the appearance at a hearing, of the person who has them. A subpoena duces tecum may be legally issued only by a Virginia court or an attorney who is an active member of the Virginia State Bar. In civil cases, such as a divorce case, it may be issued to anyone, whether or not they are a party in the divorce case, who has in their possession documents relevant to the case. Identify any documents needed for the case not obtained during discovery. This may include any sales receipts, deeds or titles, bank account or IRS information, any written agreements entered into by the other spouse that effects his finances and property ownership, or medical records. Identify who has these documents in his possession. Download the subpoena duces tecum form from the Virginia Judiciary's website. Provide the name of the individual who has the documents, such as the document custodian, and list the documents needed. Include a Notice to Health Care Entities and Notice to Individual, available from the court, if the subpoenas request medical records. Check the appropriate box that indicates whether the custodian must deliver the documents to the court or the clerk, and fill in the date on or before which the documents are required. Check the box that requires the custodian to appear at the hearing, if his appearance and testimony is desired. Take the subpoena to the family law court clerk of the court handling the divorce case. Sign the form before the clerk, who notarizes and files it in the case. Take the official copy of the subpoena and deliver it to the documents' custodian at least 15 days before the hearing for which they are needed. An attorney may issue the subpoena by signing the form and delivering a copy to the sheriff's office for delivery to the custodian. Have the party serving the subpoena fill out and sign the return of service, downloaded with the subpoena form. The serving party must sign the return and indicate to whom the subpoena was delivered and on what date. 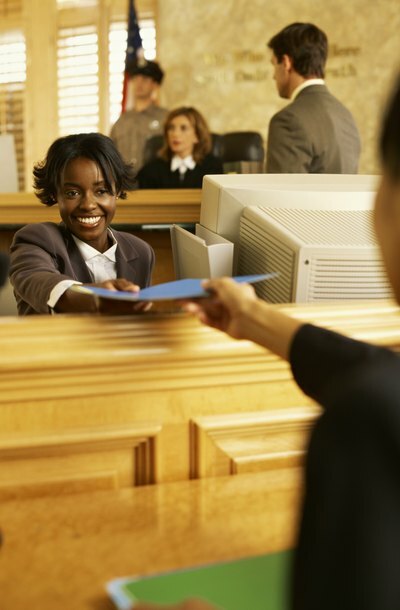 Once complete, take the return of service to the court clerk, who files it in the case. The custodian must produce the requested documents by the hearing date noted on the subpoena form. If his attendance and testimony at the hearing are also requested, he must appear in court at the designated date and time.